GIGABYTE TECHNOLOGY Co. Ltd., a leading manufacturer of motherboards and graphics cards, today announced the latest GIGABYTE 7 series motherboards, the very first to offer fully certified dual onboard Thunderbolt ports. Capable of connecting up to 12 devices plus 3 digital displays simultaneously, with breathtaking data transfer speeds that can transfer 1TB of data in only five minutes, GIGABYTE Thunderbolt motherboards offer the fastest connection interface ever on the desktop PC. 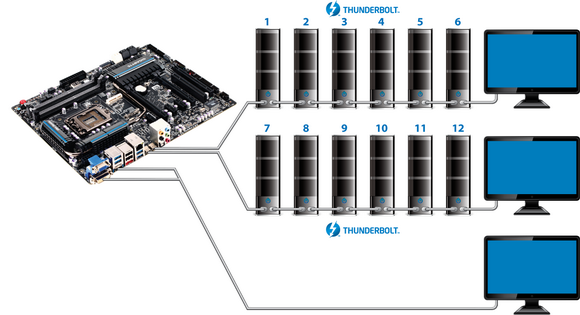 GIGABYTE Thunderbolt motherboards allow users to daisy chain up to 12 devices simultaneously via an incredible bi-directional 10Gbps data pipeline that includes both PCIe and DisplayPort traffic. 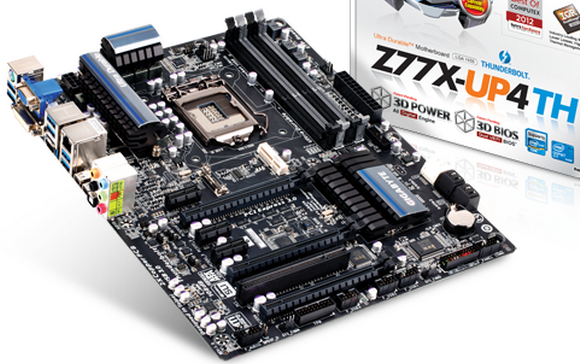 GIGABYTE Thunderbolt motherboards redefine desktop PC connectivity to make it far easier to connect multiple high speed storage devices and HD displays to your PC than ever before. "GIGABYTE's new dual port Thunderbolt motherboards are an exciting innovation, giving incredible performance and are perfect for video and film professionals using Thunderbolt and the PC," said Grant Petty, CEO, Blackmagic Design. "Customers using our wide range of Thunderbolt devices will now be able to choose to work in whatever format they need, giving them the flexibility to build whatever production and post production workflow they need." "As the first Intel certified cable vendor, Sumitomo is delighted to see GIGABYTE bring the first dual port Thunderbolt motherboard to market, creating the ultimate connectivity for desktop PCs, commented Motoi Matsuo. 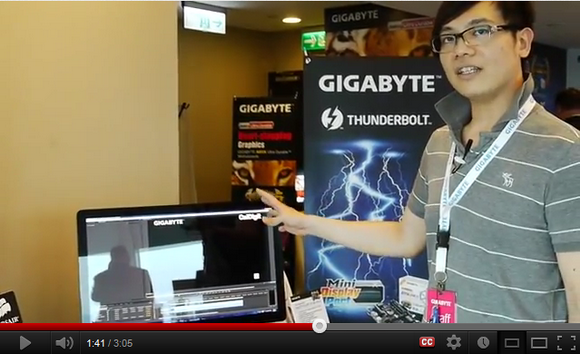 "These new Thunderbolt motherboards are also the perfect fit for Sumitomo's exclusive high speed 20m optical cables." "Thanks to their dual Thunderbolt ports, Gigabyte's new 7 series motherboards deliver unbeatable flexibility", says Adam Steinberg, Vice President Marketing at Elgato. "The unique dual port feature enables users to combine multiple portable Thunderbolt devices like the powerful Elgato Thunderbolt SSD." GIGABYTE Thunderbolt motherboards are the first to be certified by Intel featuring dual Thunderbolt ports directly on the motherboard back panel I/O, with each Thunderbolt port supporting a maximum data transfer speeds with simultaneous bi-directional data transfer at speeds of up to 10Gbps - this means you can transfer a full HD 1080p movie in under 30 seconds. GIGABYTE's dual port Thunderbolt implementation ensures the absolute maximum potential connectivity, with support to connect up to 12 individual devices simultaneously, with each port offering full 10Gbps bandwidth. Thunderbolt combines both DisplayPort and PCI Express protocols over a single cable so that users can connect a multitude of device types in tandem with HD streaming video and 8-channel audio, simultaneously in one specially developed cable. Users can also enjoy improved flexibility by 'daisy-chaining' several devices while still enjoying low latency and industry-leading data transfer speeds. The GIGABYTE Z77X-UP5 TH and Z77X-UP4 TH both employ award winning GIGABYTE Ultra Durable 5 technology that includes high current capable components for the CPU power zone including IR3550 PowIRstage ICs from International Rectifier, 2X Copper PCB and high current Ferrite Core Chokes rated up to 60A, which together are able to deliver up to 60°C* cooler temperatures than traditional motherboards. 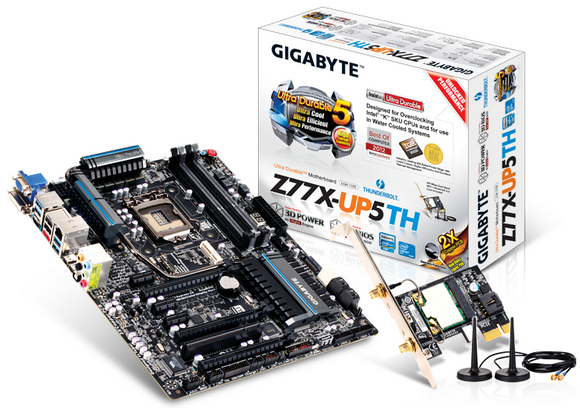 Featured on a range of new motherboards based the Intel X79 and Z77 Express Chipsets, GIGABYTE Ultra Durable 5 technology is the next evolution in quality motherboard design. *Up to 60° C lower temp. obtained using 4 phase IR3550 PowIRstage with 2x Copper PCB vs. 4 phase D-Pak MOSFET @ 100A load 10 mins lab testing without heatsink. More product details can be found on the GIGABYTE website here: www.gigabyte.us.